Maalot Chanichim are Great Role Models! On Friday, the chanichim (campers) finally received their Gurim buddies! 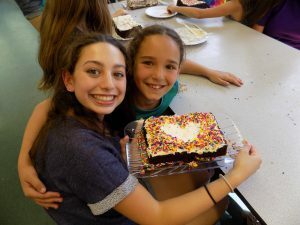 Every year at Yavneh, Ma’alot has the opportunity to be paired up with a buddy from the youngest ayda (unit), Gurim (8-10 year olds), and throughout the summer they have activities with their buddies. buddies! During zmirot (Shabbat songs) on Saturday afternoon, Ma’alot had another chance to sit with their Gurim buddies and sing with them. We are so proud to see what great role models Ma’alot are for Gurim!! For one of our peulot chinuchi (educational activities), we learned how to make our own tzizit! First, everyone tie-dyed a four-cornered cloth for another person in the aydah, and then we learned how to tie the strings onto each corner to make the correct sequence of knots. While half the aydah was learning how to tie the strings and knots, the other half watched the film Salach Shabati and learned about how there are many kinds of Jews in the world from all four corners of the earth, just like there are four corners on the tzizit! It was an awesome activity and the chanichim are so excited to start wearing their tzizit during t’fillot (prayers). We have also started practicing for Zimriyah, the much anticipated camp-wide singing competition, which will be on July 16. The chanichim are super excited about the three song choices for their aydah! We have so many exciting things planned for the upcoming week, and we can’t wait to check back in with you soon! !